Quorn villagers on Tuesday night said goodbye and thank you to Nurse Eleanor Gracey, district nurse in the village for 30 years, with the presentation of a retirement gift of a convector fire and a cheque. The presentation, which was held in the Church Rooms, Quorn, was paid for by a collection among villagers, which raised about £145. Nurse Gracey, who officially retires today (Friday), did her midwifery training at Leicester and Leicestershire maternity hospital. She was appointed midwife in September 1934 and gained her district nurse experience in the Plaistow district of London. She is to spend her retirement in Northumberland where she was born. The gifts were handed over by Dr W H Wykes, who spoke of Nurse Gracey's work in the parish. He told how, until ten years ago, when she was provided with a car, she visited her patients on a bicycle and during the whole of her 30 years' service she had missed duty only once through illness. The vicar, the Rev S S Jackson paid tribute to her devotion to duty, and said that he, like everyone else, had always been amazed by her calmness and efficiency. Thanking everyone, Nurse Gracey said she would be leaving Quorn with considerable regret, but would always hold the village and its people dear at heart. 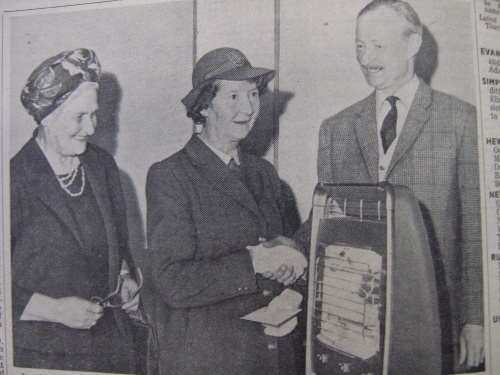 In the picture (left to right) are Councillor Miss L Facer, Nurse Gracey and Dr W H Wykes, who made the presentation.